Best in class roof coatings and paints for your home and business. 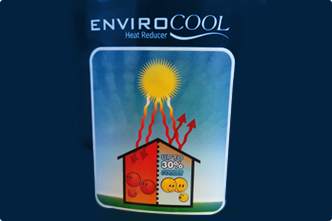 No matter how hot it gets outside, you can be guaranteed a cool interior with the Deluxe Coatings EnviroCOOL Heat Reducer Roof Coating. It is a specially designed coating with impeccable heat reflective capabilities proven to reduce the overall temperature within the house. Deluxe Coatings EnviroCOOL Heat Reducer is suitable for use on cement and clay tiled roofs, metal deck and caravan roofs. All surfaces must be water blasted clean, dry and free from wax, grease, etc. Surface must be primed with Deluxe Coatings EnviroCOOL Primer. Do not apply if surface temperature is less than 12°C or if humidity is above 80%. Acrylic Resin based Exterior Coating. Suitable for brush, roller and airless spray. Apply 2 coats of Deluxe Coatings EnviroCOOL Heat Reducer to specifications. Apply 1 coat of Deluxe Coatings 100% Acrylic Clear Glaze to reduce dust build-up. 2 square metres per litre. White, Colour Bond Smooth Cream, Colour Bond Mist Green, Colour Bond Dune, Colour Bond Gull Grey, Colour bond Off White.